Check out our panel announcement for ‘Death of an Astronaut’, below which take place at this years East Coast Black Age of Comics Convention (ECBACC). The panel is Saturday, 5/19/2018, 5-6 pm at The Tech Freire Charter School. 2221 North Broad Street Philadelphia, PA 19132. 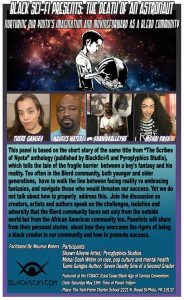 Maurice Waters (President/ Founder of BlackSci-Fi.com) will moderate the panel which will feature novelist and BlackSci-Fi.com writer Tuere Ganges (whose work “The Death of an Astronaut” is the focal point of the panel discussion), BlackSci-Fi.com writer M’Shai Dash, and editor of “Scribes of Nyota”, Shawn Alleyne of Pyroglyphics Studio. If you’re in the Philly area, or are visiting the convention, please stop by this informative and thought provoking panel which focuses on nurturing the inquisitive minds of our blerd youth, and helping them to realize that they are capable of doing anything they set their minds to. What’s Cooler Than Donald Glover Giving A Tour Of The Millennium Falcon? Not Much.